Chief rabbi of Prague; died Nov. 12, 1753. 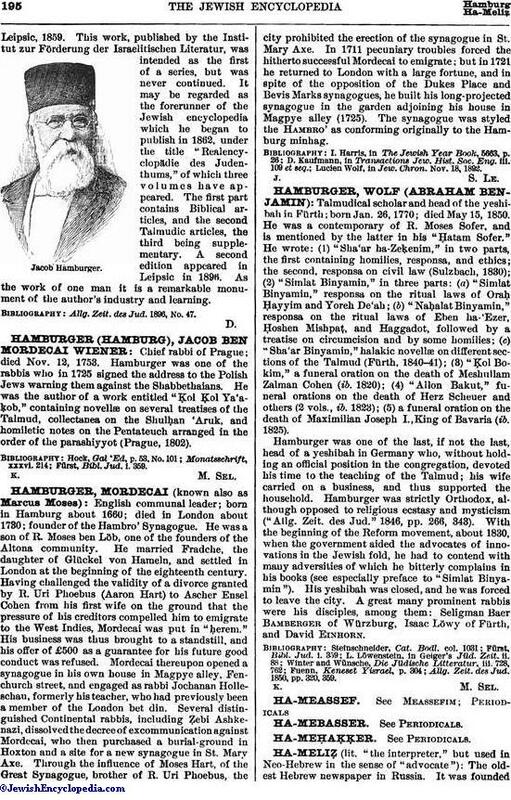 Hamburger was one of the rabbis who in 1725 signed the address to the Polish Jews warning them against the Shabbethaians. He was the author of a work entitled "Ḳol Ḳol Ya'aḳob," containing novellæ on several treatises of the Talmud, collectanea on the Shulḥan 'Aruk, and homiletic notes on the Pentateuch arranged in the order of the parashiyyot (Prague, 1802). Fürst, Bibl. Jud. i. 359.